It's cold outside, ain't it? I have no idea where you live, but most likely it's pretty chilly wherever you are. It's just been starting to get cold where I live, which can be a good thing and a bad thing. Don't you wish there was some sunshine this Winter? I've posted about Sunshine, one of my dog-washing clients, in the past I believe. 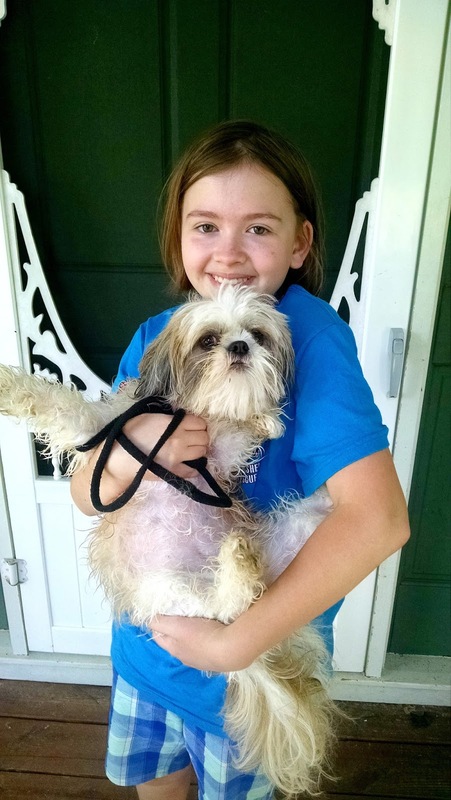 She's a gorgeous Shih Tzu with beady black eyes, a button nose, and a very soft and silky coat. Not to mention she has a very sweet, loyal demeanor and the complex of a larger dog. This is Sunshine before her bath a few months ago. I know I'm holding her in a weird position, but that's the only way that I could hold her without her squirming away from me! Perhaps she wishes to show her very pronounced pink belly. Whatever it is, this pup is as cute as can be! Now that I get a good look at it her cute pink belly really hits the spot. Sunshine knows how to pose! We are freezing here, it has been -20F the last 2 days! Sunshine is very sweet! Wow! It's 30-40 here these past few days and I think that's crazy! Yes, Sunshine is a very lovely girl!